Located near the highway, clean, quiet, affordable, with a Very Good Free Breakfast.... perfect for Travellers. We absolutely loved the pool. My young son played in the shallow kiddie pool and my daughter was able to go down the water slide on her own, with a life jacket. We will definitely be going back. Where to find Edmundston hotels near an airport? Where can I find hotels in Edmundston that are near tourist attractions? So, are you vacationing in Edmundston - Grand Falls and looking to reserve a hotel in or near Edmundston? There are 8 Expedia-listed hotels within a 0.1-kilometre (0.06-mile) radius of the heart of town. 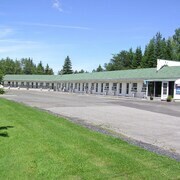 Edmundston has a selection of centrally located lodgings, such as the Comfort Inn Edmundston and Happy Motel. 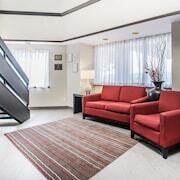 The Four Points by Sheraton Edmundston is a budget-priced accommodation option. 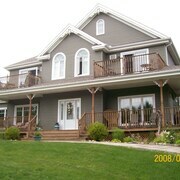 It is situated 1 kilometre (1 mile) from the center of Edmundston. 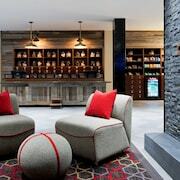 For another option, you may like to check out the amenities and rates at the Auberge Les Jardins Inn. 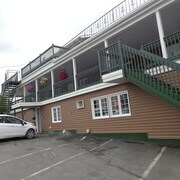 You could also check out the Best Western Plus Edmundston Hotel and the Travelodge Edmundston. 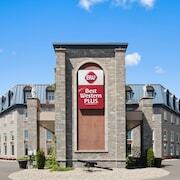 The Best Western Plus Edmundston Hotel is 0.9 kilometres (0.5 miles) from the center of Edmundston. 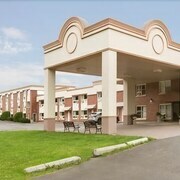 The Travelodge Edmundston, is located 3 kilometres (2 miles) away. Two other hotel options include the Days Inn Edmundston and the La Roma Motel. Looking for more to do? Spend some time exploring Cultural Walkway and Perth-Andover Museum, which you'll find in Perth-Andover, 85 kilometres (53 miles) to the southeast of Edmundston. 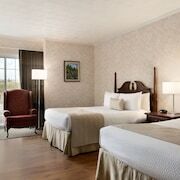 Some of our recommended Perth-Andover hotels include the Castle Inn & Restaurant and Perth-Andover Motor Inn. 55 kilometres (36 miles) to the southeast of Edmundston, you may also choose to stay at Grand Falls, home to the Best Western Plus Grand-Sault Hotel & Suites and Cote's Bed & Breakfast Inn. The Grand Falls Golf Club and Commission Des Chutes and De La Gorge are just some of the more popular points of interest to experience when you're in Grand Falls. Situated 80 kilometres (49 miles) away from Edmundston is Northern Maine Regional Airport. Stay nearby at Hampton Inn Presque Isle or Presque Isle Inn & Convention Center. What are the most popular Edmundston hotels? Are there hotels in other cities near Edmundston? What other types of accommodations are available in Edmundston? Explore Edmundston with Expedia.ca’s Travel Guides to find the best flights, cars, holiday packages and more! Flights from Buffalo Niagara Intl. to Tampa Intl. Flights from Heathrow to Fiumicino Leonardo da Vinci Intl.